The club has been informed of the death of Colin Manning OH 1937 - 1944, O.B.E. D.L. J.P., former Livestock Auctioneer, died peacefully at home after a short illness on June 8th, 2012, aged 84 years. Beloved husband of May, father of Jackie, grandfather of Christopher and great grandfather of William. A Thanksgiving was held at Hereford Cathedral on Wednesday, July 4th 2012, at 2.30p.m. following private Cremation. 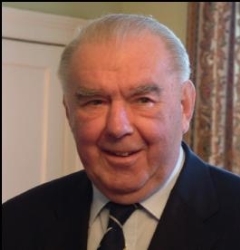 The OH Club has been informed of the death of Colin Manning, OBE, DL, JP, who died peacefully at home after a short illness on 8 June 2012, two days before his 85th birthday. A memorial service was held at Hereford Cathedral on 4 July. At HCS, Colin was a former Head Boy. Until his retirement in 1994, he was a partner in Sunderlands and had been a popular livestock auctioneer for forty-eight years. He served on the board of Hereford Cathedral Perpetual Trust and had also been a Deputy Lieutenant of the county. In 1961, at the age of 33, he became a JP and served on the Hereford City Bench as well as the Herefordshire Petty Sessional Division. He retired from being a magistrate n 1997, a year after being awarded the OBE for his services to magistracy in the county. From his days at HCS, Colin developed a passion for rugby. He played for the Old Herefordians, which combined with the Hereford Rugby Club in 1948 to create a stronger team to represent the city. Colin was elected captain of Hereford Rugby Club for the 1950-51 season and served on the club committee for many years. Of HCS, Colin had many fond memories: “We still have happy memories of these events at HCS generally with the spartan surroundings and totally male orientated with 14 masters and 190 boys. ‘Oh Happy Days’ which provided a complete life experience of which we all benefited.” He continued to take great interest in the fortunes of the school through his membership of the OH Club, serving for many years as a greatly valued member of the OH Club Committee. He will be greatly missed. Colin is survived by his wife May, daughter Jackie, grandson Christopher Morgan (OH) and great grandson William.